Not sure that I want to see the rest of the 6 Nations after the miserable results of Saturday…. I returned to Gravesend, travelling on High Speed 1 which is unbelievably fast – 23 minutes from St Pancras, arriving at 9.48am. I nipped into the loo opposite the station and my chat with the nice lady cleaning it was probably the high point of the day. There is practically nothing I can say about the whole area of Gravesend, the Hoo Peninsula and the Isle of Grain that would not attract a libel suit. Of all the walks I have ever done in England, Wales or Scotland, this was probably the dreariest, ugliest and most littered. Presumably it looked very different to the Saxons when they arrived, otherwise I am pretty sure they would have turned their longboats around and sailed straight back again! The Saxon Shore Way begins at the statue of Pocahontas and travels along the river front, past the town pier (the oldest iron pier in existence, apparently). 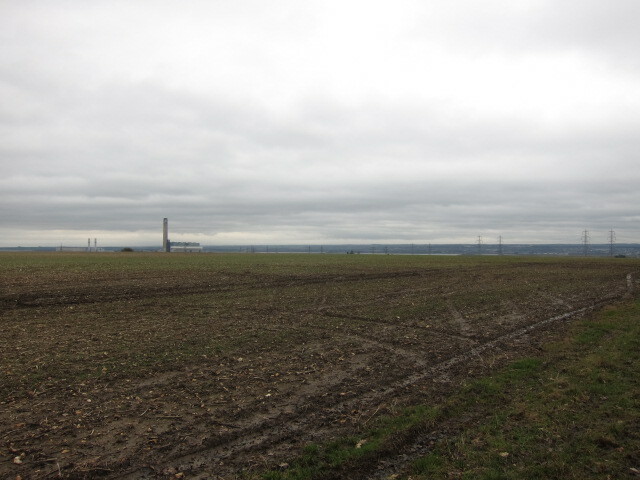 On the opposite bank, Tilbury docks loom large. The path winds its way through an industrial estate – concrete on one side and metal railings on the other, with weeds, bits of broken iron and rubbish everywhere. 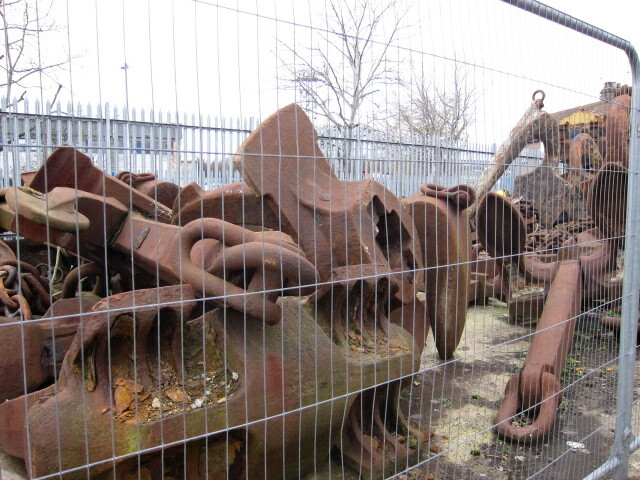 There is even a yard full of rusting anchors. Leaving the town, it continues along a sea embankment, with marsh to the inland, and, beyond a further embankment, the sound of trail bikes a constant hum. There are herds of shaggy ponies everywhere, grazing amongst the broken supermarket trollies and old milk containers. I suppose they are specially adapted to the marsh grass and the boggy ground, otherwise they must be martyrs to foot rot. As you approach the Cliffe Pools Nature Reserve, the path is shown as crossing a narrow tongue of land, then splitting so that the modern coastline can be followed, or the earlier Saxon line. My plan had been to follow the modern coast, but it was impossible to cross where the map indicated, either because the marsh constantly moves or because of the tides. I followed an alternative path, meaning to take a detour via the attractive gravel works, but, after casting about for quarter of an hour in mud that almost sucked my boots off, I hit another dead end with a fast flowing stream. I contemplated taking my boots off and wading through, but not knowing if it was ankle, knee or neck deep decided on discretion. 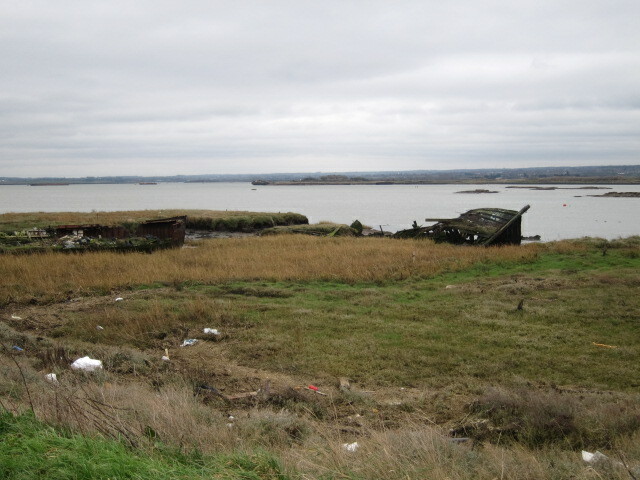 I returned to the lovely gravel pits, and walked around the back, joining the Saxon Shore Way on the other side of the Nature Reserve – flocks of Twitchers everywhere, although the only birds I saw were seagulls. At this point, I could have struck back to the modern coast, but considering the time, the general bleakness of the scene and the fact that I could occasionally see the coast through the scrub, I decided to stick with the Saxon Shore Way, travelling through Cliffe and Cooling, thinking to myself that Boris is absolutely right to want to put an airport here. It would improve the scenery no end. The Saxon Shore Way is not always well signposted, and I was rescued from a grim car park in Cliffe by a kind lady who approached me and told me the way. She then immediately asked if I were concerned about preserving the area and directed me to the “No to the Estuary Airport” Facebook and Twitter page. I did not want to hurt her feelings, so said I would give it some thought. Which I have – bring it on! 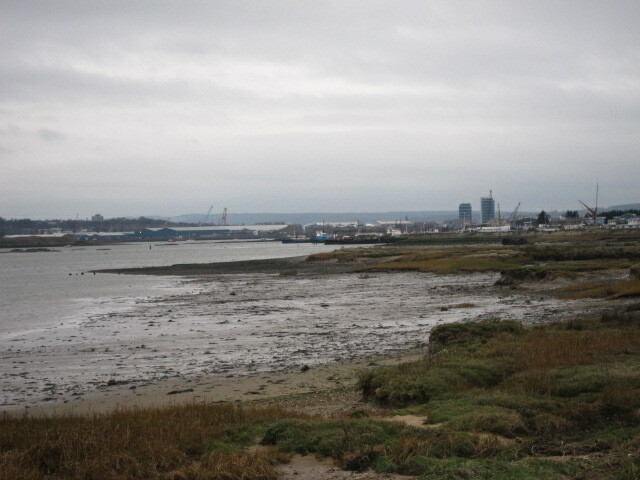 Reaching the shores of Medway, the path continued to be littered with debris – probably not cleaned up since the Dutch Fleet sailed up the river to attack the British Navy in the 1670s. At one point it is necessary to walk on the shingle – after passing a sign saying it is liable to flooding and to check the tides. Bit late at that point! Upnor Castle and Village were almost attractive, but I was so jaundiced by this point that I couldn’t really appreciate them. I crawled into Strood station, glad to escape the Mud of Kent (or is it the Kentish Mud?) having a felt a muscle pull about twenty minutes before the end. Oh dear – still at least it can only get better! And the Italy v. France game turned out to be very good. “Castleton1” was me – think I’ll get the hang of this soon!!! Blimey! I guess if you are travelling the entire coast of Britain you will get to see the ugly as well as the beautiful……………….and at least now you know you can always join Boris’ PR team for the Estuary airport if things get desperate!